live calls and a private Facebook group? The easiest way to learn and get support with Facebook, Twitter and YouTube ads that will help you make more money while staying in 100% integrity with your core values. You break into a cold sweat because you don't want to mess up or throw away a bunch of cash down the endless paid advertising hole. Facebook Ads Manager you want to throw up. You can't understand why 'everybody' else's ads are working and yours aren't. You think there's a magic checkbox or button that if you just knew where it was all your paid ads dreams would come true. YOU WANT TO RUN THEM BUT DON'T HAVE TIME FOR THE LEARNING CURVE! Facebook, Twitter and YouTube ads are scary! Look, paid ads won't solve all your problems. It's garbage in, garbage out. Meaning, if you have a crappy product or service, running ads won't make it awesome or desirable. If you have a really amazing product or service and you want to get in front of the right people with the right message so you can start racking up sales or clients then you gotta get into paid ads. I don't care what's going on with Zuckerberg, Congress and all that jazz. Paid ads like Facebook still have the best available information to help you reach your ideal customer. Seriously though, anybody can input an ad. What most can't do is do it the right way and actually use marketing skills to get them to work. So if you want to find out how to not waste money on ineffective ads then keep reading! While I won't say you're able to put your ad in front of every single niche, I will say you can get in front of most all of them. From commercial laundry equipment sales to high ticket coaching. Your ideal customer is on Facebook! 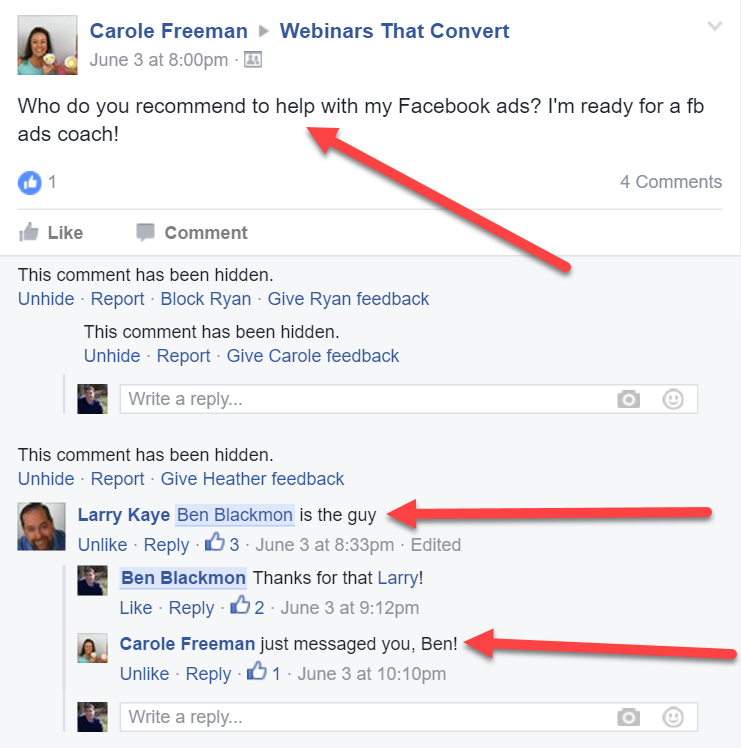 Facebook ads or any paid ads are only as good as your ability to track them. The great thing with Facebook is you can do this pretty easily and once you see results that motivates you to keep going. You may not hit a homerun with your first ad but once you find an ad that works you're going to want to scale it. Facebook ads let you do that in style! Facebook Ads With a Twang for Beginners Course - There are 20 total videos with accompanying worksheets. Each video is broken down in step by step chunks to make it easy to follow even if you despise tech! Updates / Changes - Facebook ads change a lot. Some of those changes won't impact your ads but some of them you better know and find out fast! You'll get updates whenever there is a change that you need to know about as well as update to videos as necessary. 2 Live Calls Per Month With Me - Because I want to see you succeed and be able to make your paid advertising work I will be doing 2 live video calls each month where I'll answer questions, as well as do my famous 'Autopsy of Dead Facebook Ads' - Sometimes if they're just dying we will see about resuscitating them. Private Facebook Group - You'll get access to my Marketing With a Twang Facebook Group where there will be support from me, my team and other members. It won't always be instantaneous but your questions will be addressed and answered. There will also be a FAQ section for answers that you'll have access to as well. Facebook Ads for Coaches Course - This is designed for Life, Health, Business or other service providers who want to market their high end services using Facebook ads. There are 25 videos with worksheets and just like all my courses each video is step-by-step in small bite sized chunks. High Ticket Coaching Webinar Course - This course will help you get your high ticket coaching offer ready by using automated webinars. This works well for coaches and other service providers to bring maximum profit while being as hands-off as possible. If you've been thinking about using messenger bots to grow your business, help with customer service or just interact with your customers then this course is for you. Discover how to maximize your reach using YouTube and take your business to the next level. YouTube is wide open right now and video is extremely powerful. You'll learn how to take advantage of this massive search engine. Learn how to use Twitter ads to grow your brand and sell your services even if you don't have ANY FOLLOWERS AT ALL! Ben Blackmon is a brilliant, marketing strategist. He has coached me and he has provided, professional “Done for You” services for me. He worked with me collaboratively to help me on the copy, images and targeting for my Facebook Ad campaigns. He personally checked my entire high-ticket funnel from the registration page to the webinar to the application, etc. He checked every detail. Twice. He really understands the strategy that I am using and I know I couldn’t have found anyone more knowledgeable and experienced to set up and manage my ads and the funnel or anyone better prepared to interpret the data that we get back from the Ads that we are testing and make adjustments if needed. Everything is up and running and I am ready to start booking discovery calls and signing dream clients from this automated system this week! . I have worked with a lot of people on many projects and there is no one I would rather work with than Ben! Hey there this is Jessica Riverson from permission to charge and I'm a business coach. 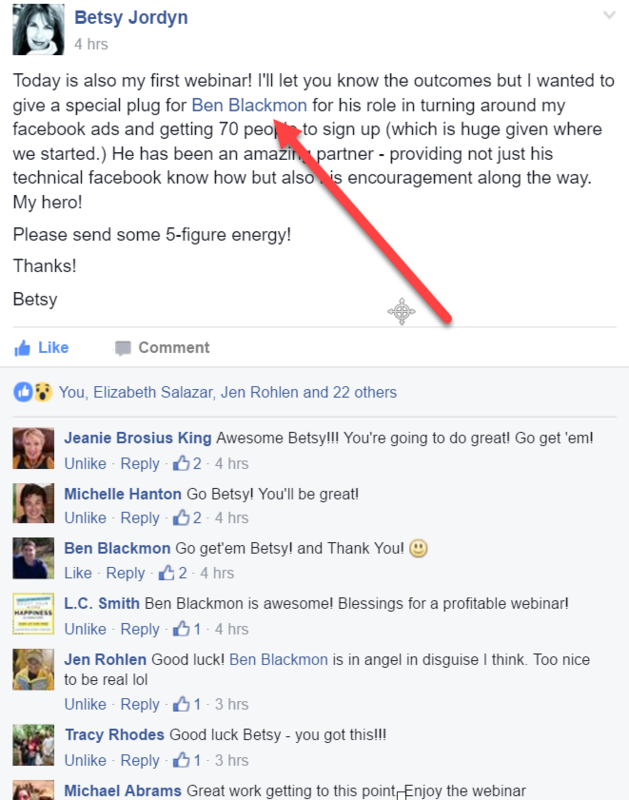 I've been working with Ben Blackmon for about a year-and-a-half and he is someone that we call the Facebook ads God. When my husband and I started our Academy and then our Mastermind we hired Ben. We worked with other people and he is the only Facebook expert I have stuck with for this long. 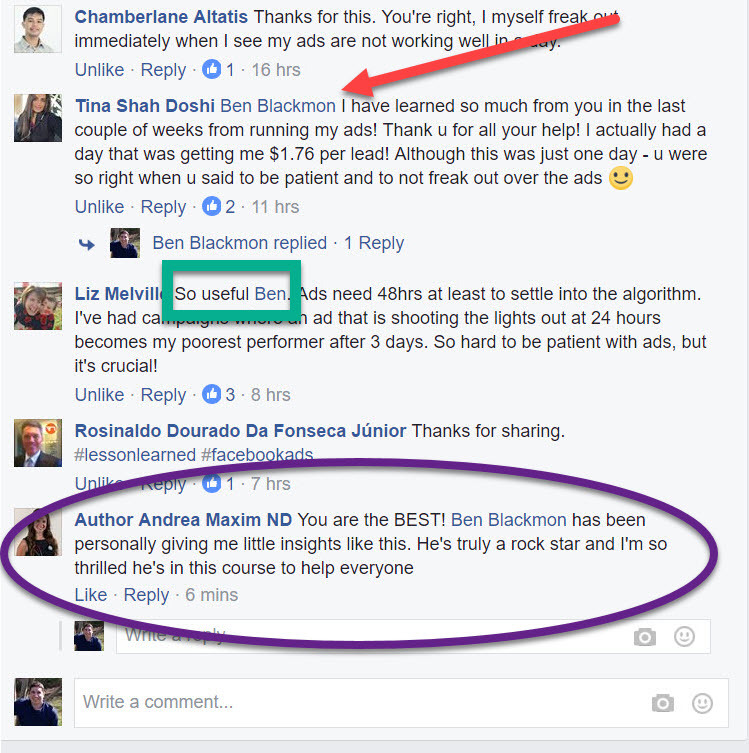 Recently we were able to take a $4,000 Facebook ad investment and turn it into $62,000 in sales and that's because Ben is that good. Thank you Ben for everything you do! "Ben is an extremely knowledgeable, well-rounded marketing expert with a real passion for helping people. I've been able to make significant strides in my business by following his advice, and I highly recommend his services to any entrepreneur who's truly ready to take things to the next level." 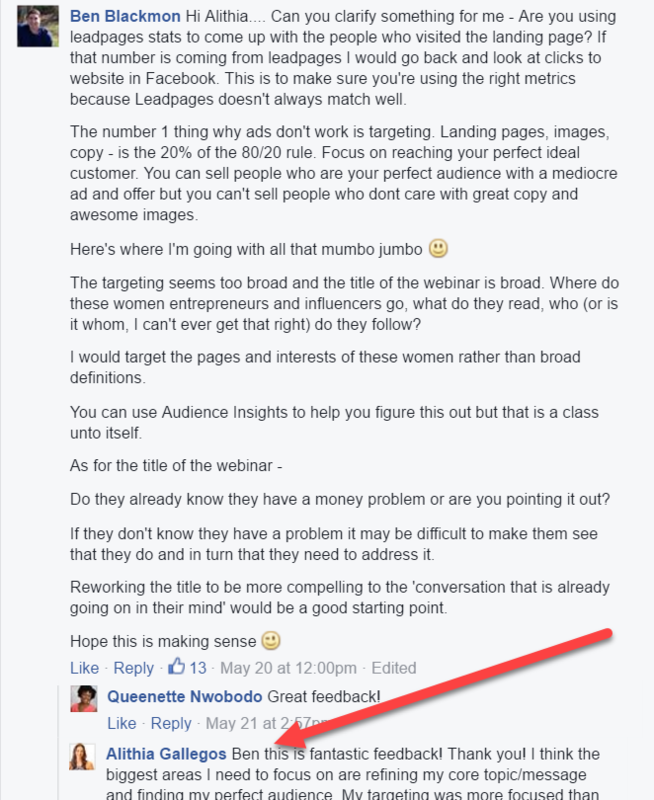 "I was completely overwhelmed trying to get started with Facebook ads. I setup a call with Ben and in 30 minutes he was able to help me better understand the basics of using Facebook's PowerEditor, which is no small task! It was clear talking to Ben that he is knowledgeable in google ads, Facebook ads as well as creating landing pages. As a business owner, it was important to me to talk with someone who is familiar with how those areas are connected. Thank you Ben for you help! " "I heard about Ben through a member in my Facebook Group and she HIGHLY recommended him. And I know why. If you're looking for competence, knowledge, guarantee, and your project in capable hands, then Ben is your man! I will certainly be working with him in the future, as I couldn't imagine anyone else - with better value - doing my projects for me."